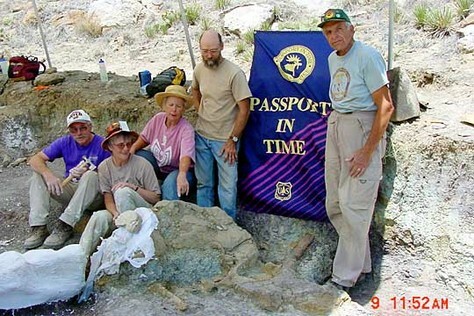 In May 2001, the Comanche National Grassland hosted the second-ever paleontological PIT project. Twelve volunteers gathered in Picketwire Canyonlands, a rugged, deeply carved valley in southeastern Colorado renowned for its wealth of historical and prehistoric archaeology. But there are much older “tales” in this river valley. The canyonlands are also home to the largest dinosaur track site in North America, with more than 1,300 footprints of late Jurassic dinosaurs exposed in limestone layers along the Purgatoire River. The walls of the valley are composed of rock layers dating to the Jurassic-aged Morrison Formation, known to produce dinosaur skeletons in many parts of the Rocky Mountain West. Although only fragments of dinosaur bone had been noted in the canyonlands prior to the 2001 PIT project, the volunteers nevertheless spent a hot, exhausting week combing the canyon walls searching for fossils. 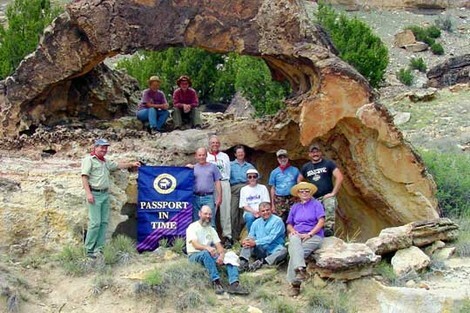 Very little of real significance was discovered during the project until the last day, when George Sweeney, a volunteer from Ogden, Utah, emerged from a remote canyon and straggled back to the group gathering for lunch. George produced a handful of petrified wood from his backpack and showed it to me. Amazed, I told George that this was not petrified wood but, rather, dinosaur bone. When I asked George if there was more, he said, “The ground was covered with it.” Thus began the discovery and investigation of the second-most-significant dinosaur site so far known in Picketwire Canyonlands (the first being the track site). The crew returned to Sweeney’s discovery site and found enough dinosaur bone on the surface to fill two ice chests. More important, an ischium (pelvis bone) was noted emerging from the shale layers, and a little scratching showed that the bone continued beneath the surface. All were excited to begin excavation of the skeleton the following year. In June 2002, the original PIT crew returned to the discovery site with brushes and trowels in hand. 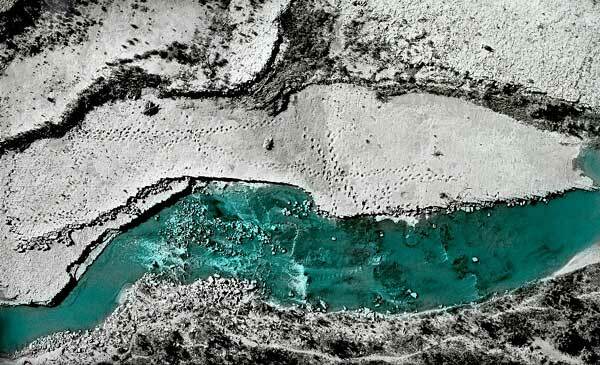 A quarry began to take shape, with assistance from the Sternberg Museum of Natural History in western Kansas. This year, the crew uncovered major portions of a large sauropod (“brontosaur”) skeleton, including two vertebrae, five ribs, a partial femur, and several pelvis bones. Because the bones are so large, only a few can be uncovered each year, and we anticipate this quarry (along with those yet undiscovered) will keep PIT volunteers busy for many years to come. We look forward to uncovering more of this beast (“Woody”) in future PIT excavations. We will also host additional PIT projects to search for more dinosaur skeletons. At present, we have surveyed only a small percentage of the potentially fossiliferous areas in Picketwire Canyonlands. Who knows what other beasts are out there waiting to be discovered!